Half Moon, Wrangell - St. Elias National Park, Alaska. Half Moon, Wrangell – St. Elias National Park, Alaska. 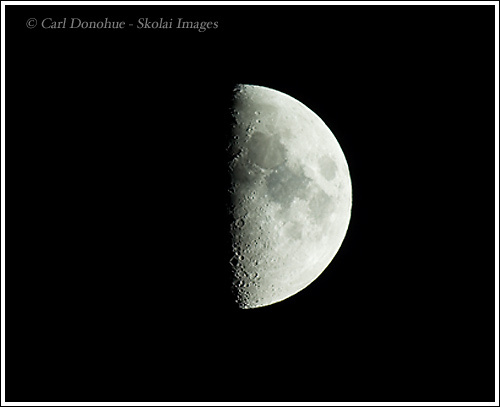 Summer solstice just passed us by, so I thought I’d post the only solar image I have – a Waxing gibbous moon, just after the half moon, Wrangell – St. Elias National Park, Alaska, from this past spring. I was really hoping to spend summer solstice up on the same ridge that I spent winter solstice, but wasn’t able to swing it, as I had to scurry back in to Anchorage to prepare for a trip, which I’m currently on. I’ll post one more photo from the spring while I’m gone, and then try to get some images up from my present trip. I’ll try (I mean that, REALLY try) to keep some regular posts going, but this time of year is it hard to do so. This entry was posted in Alaska, Wrangell - St. Elias National Park and tagged half moon, Waxing Gibbous moon, Wrangell - St. Elias National Park, Wrangell St. Elias on June 23, 2009 by Carl D.
Did you have a good trip to Icy Bay? Hope all is well! Don’t know if we can swing it, but I am Alaska bound in September. Would be great to hook up at some point. Thanks. I haven’t been to Icy Bay. That’ll be later in the year. Definitely try to meet up when you’re here. Oops isn’t that a lunar shot? Uhhmm .. sure .. a lunar shot.